Back by popular demand! On Thursday February 28, our first event to kick off the weekend will be the PUGGY PARTY BUS! 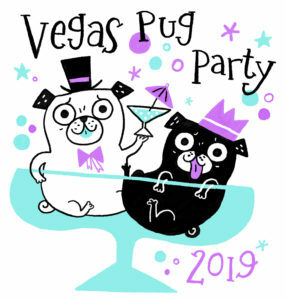 Tickets are available here: https://vegaspugparty.ticketspice.com/thursday-night-pug-party-bus There is limited capacity for this event so purchase your tickets before they sell out! The Party bus will pick us up promptly at The Lake Las Vegas Hilton at 7pm on Thursday February 28th, 2019. This will be a 2 hour ride. They will take us up the strip. We will take a group photo at the Fabulous Las Vegas sign, then return back to the hotel by approximately 10pm. The party bus is a lot of fun! We are allowed to bring our own drinks. There will be music videos playing, people singing, flashing lights, and probably a pug or 3 pole dancing. 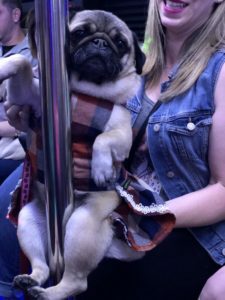 We will not be getting off the bus except for at the Las Vegas sign so no strollers are needed but pugs do need to sit on your lap or on the floor. We are limiting the capacity to 35 people plus pugs per bus and right now have 3 buses reserved. If flashing lights and loud noise bother you or your pug but you want to go, let us know you would be interested in the designated quiet bus. NOTE: The party bus ride must be purchased separately from the rest of the weekend festivities (it is not included in the all-access weekend pass, as many people will not arrive by Thursday evening). You will see a $3 fee for each ticket also- that is to cover the costs for credit card processing and fees from TicketSpice.